This card is a little different for me and I debated whether or not I should post it. The stamp set is She Said by Unity and it was a gift. I had no idea at the time there was so much controversy surrounding Donna Downey’s designs. I hope this card will inspire you to mix things up a bit and try another style. The image and sentiment were stamped in StazOn Black. I colored her hair with Prismacolor pencils and Gamsol. Her lipstick was done with a lavender spica pen and I love the way it shimmers like lipgloss. 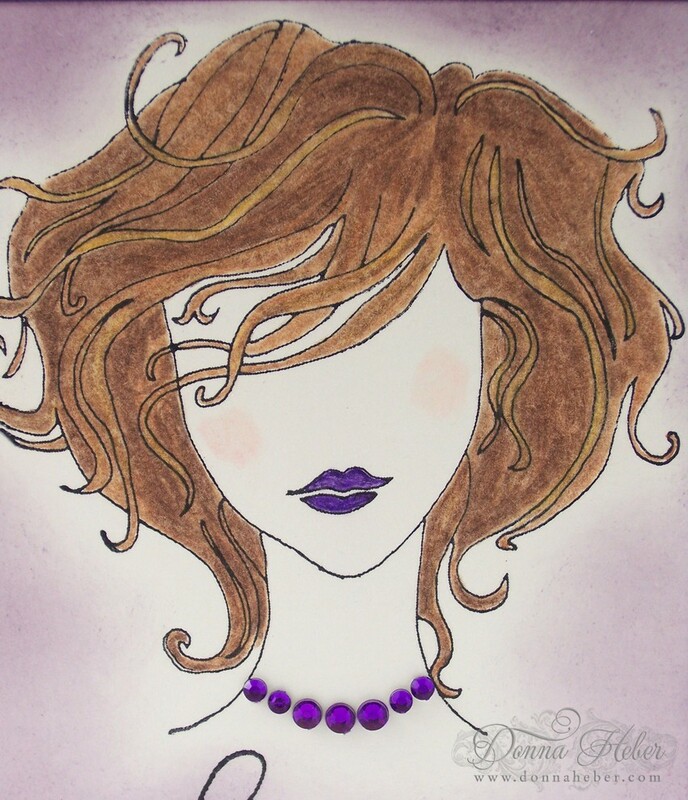 I sponged around the image with Perfect Plum then added a pretty faux necklace using dark purple rhinestones. Since I donate cards to charity I would like to make a few more of these to send off to Little Life Preservers. A close up of her necklace. I've not heard of these stamps but do I ever like it! Great idea for the necklace and then to match the lipstick; awesome card. Love your card! The way you colored the hair really gives it texture. Very nice! 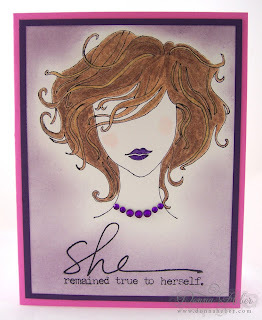 Beautiful card, and you have an awesome blog! Love all those previews garden's post. Glad you posted it Donna, it is fabulous. THIS CARD IS LOVELY DONNA. YOU ARE VERY CREATIVE. Beautiful job coloring! I didn't know there was controversy over any stamps or company's. This is pretty ... glad you shared it with us! Cool stamp, nice coloring! Love the necklace! I think this card is outstanding!! I love how you used the purple for the necklace and lipgloss. Too cute. Enjoyed the card. 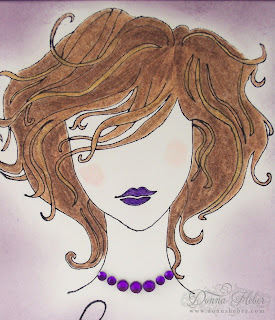 I especially like the way you made her necklace and the use of purple. Love it all, but that sentiment is so uplifting. What a great stamp! Love the sponging and the coloring with the prismas. I'm glad you decided to share it. Beautiful card. Love her rhinestone necklace!